An article here (automatically translated here) in Spanish about the way Galician speakers view Portuguese is quite interesting. The article is too long and the automatic translation is good enough such that there is probably no need to translate any of it here, but be careful when you see the word cult: the phrase "El portugués es como un gallego más culto" means "Portuguese is like a more cultured/educated version of Galician", not "The Galician Portuguese is more like a cult" as Google would have you read it. 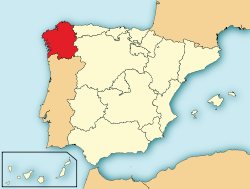 The basic gist of the article is that Galicians see learning and maintaining Galician as a more or less direct gateway to the Lusophone world. Few actually end up learning Portuguese for its own sake (2,000 students last year according to the article) but since most view it as the same language with a different accent, some different words and a different orthography the number of those that learn Portuguese is not really relevant.